There's a six-word phrase that's mentioned throughout the series Once Upon A Time with great frequency. "Magic always comes with a price." Rumpelstiltskin will tell people this repeatedly, whenever they ask him for a magical favor. The idea behind it is really universal -- what you want ALWAYS comes with a price. Literally, you have to pay for things you want. But metaphorically? Well, that's also the case. Are you willing to sacrifice your morals and your friendships and your career in order to get your hands on a seemingly elusive dream? How far will you go in order to achieve your goal and what price are you willing to pay in order to get what you want? For Louis Litt, we realize that perhaps we've underestimated how far he's willing to go in order to get his name on the door. Perhaps we always -- and the characters, too -- assumed that he would be content with sitting by and letting others push him around. "Enough Is Enough" proved that when you get what you want, you often want more. That's the inherent problem when you have the very thing that you want; it's usually not enough. But in the midseason premiere of Suits, Louis Litt learns that even if he thinks he can control and manipulate the people within Pearson Specter Litt (I've lost count of how many name changes this place has gone through since season one), because eventually, people hit breaking points. Just not always in the way you might anticipate and not always the PEOPLE you might anticipate either. I find it interesting that throughout "Enough Is Enough," Louis blames Harvey and Jessica for the person he's become. He talks repeatedly about how they made him this way -- how they taught him that being upstanding and upholding the law has no real value; that the only way to get what you want is to take it by force and lie to people in the process. What's so interesting to me about this, particularly, is the fact that Louis justified his cruelty by claiming that people and situations turned him into a monster; that somehow Jessica and Harvey and the firm had the authority to change who he was, fundamentally. There's a moment late in the episode after Louis does something particularly cruel (going to Rachel and telling her she'll never be a lawyer; that all she's ever destined to be is a paralegal and OUCH I don't even like Rachel and that one really hut) that Mike confronts him. After poring over all of Louis's old cases, Mike comes to the realization that Louis keeps blaming the firm for his evolution, for what he's become. And that Louis somehow continues to think he's better than them all -- that he's finally gotten his long overdue power and respect. But Mike sees Louis for who he really is and instead of being angry, the young non-lawyer is just sad. He sees what Louis has allowed himself to become due to anger and bitterness and hatred and claims that he, himself, may have always been a fraud... but at least he's also always been a decent human being and has tried to do right by people. (The first half of this season notwithstanding because Mike was pretty insufferable then.) But Louis? Louis used to be kind and caring and used to think about how he could help people. And now he's changed -- he's turned himself into a monster. Louis gives the power to Jessica and Harvey and his circumstances when the person who truly created the mess in his life is HIMSELF. He is the only one to blame for the way he evolved and the person he became. Mike's gentle argument is that he, himself, had been through hell at Pearson Specter and had encountered horrible people and difficult circumstances and came out on the other side a decent person. Louis did not, but that wasn't a fault of Jessica's or of Harvey's or of Mike's -- it was on LOUIS. The focal point of "Enough Is Enough" is this idea of being drunk with power, which Louis is. Now that he's gotten named partner, he's feeling like a king; like the kind of person he's always wanted to be. Except... this is NOT the person that Louis ever wanted to be at all. And it's painful to watch him boss Jessica and Harvey around and make demands and verbally slam them. The thing about Louis Litt is that he's never really been a villain until now. He's always been shrew and occasionally manipulative, but never outright cruel like he was in the midseason premiere. "Enough Is Enough" works as a double-meaning, too: it is the way that Jessica and Harvey feel after enduring Louis's threats of sending them to prison for hiring Mike Ross and covering up the fact that he's not really a lawyer. But it's also the way that Louis got to where he is in this episode -- he's finally tired of being the one that people dismiss and underestimate and when he finally said "enough is enough," he took his wrath out against those who wronged him. But wrath and anger and vengeance is rather blind, if you can't tell. The episode spends a majority of the time focusing on Louis Litt whose cruel rampage through the firm makes it look like he's got the upper hand on Jessica -- something that no one EVER does. But as the episode draws to a close and Louis demands a party for getting his name on the wall, Jessica reveals something: she's added a tiny clause to his partner agreement. Namely that he is now a co-conspirator in hiring Mike Ross. In a moment of beauty, Jessica realized that the way to muzzle Louis was never going to be to strong-arm him like he did to her. No, the way to tame him was going to be through the very thing he wanted most of all. Because the problem, she notes, is that when you finally get that thing you've been waiting your whole life for? It always comes at a cost. Louis can choose to sign the partner agreement and get everything he wants, but he will now also be chained to a secret that he cannot reveal, because it'll be implicating him as well. And Louis's anger and selfishness and ambition throughout the episode end up being the very things that forcibly humble him at the end of it. There's not much to discuss in regards to the Mike/Rachel dynamic in "Enough Is Enough," except that Louis is trying to break Mike Ross down and get him to quit. Instead of piling on mindless work and torturing him though, Louis decides to go after Rachel in a move that is cold and calculated and meant to rattle Mike and drive him to quit or explode. Harvey is the one who puts an end to the maddening revenge that Louis is enacting because he a) wants to protect Mike, who is obviously really important to him, b) wants to protect Rachel who is important by proxy but is also someone who works for him and c) wants to smack Louis down in a way that no one has been able to since he made his ultimatum. Honestly, the Harvey/Mike dynamic is back to normal, which couldn't make me happier. I missed them. But I also really like that Harvey and Rachel are starting to have more of a relationship. It just feels natural. I'm still not a fan of Rachel or of the whole idea of Mike/Rachel because of everything that happened at the beginning of this season, but I can honestly say that she didn't deserve what Louis put her through. Her weakness has always been her uncertainty in herself and Louis KNEW that. He targeted her weak spot by using elements from their friendship and relationship. And that was just cruel. Speaking of using things from their friendship and relationship, Donna feels guilty for letting Louis break her (in a moment of genuine compassion, Harvey tells her that nothing is her fault and she cannot blame herself for Louis finding out Mike's secret) and is determined to convince him that their friendship meant something. But just like he is to everyone else in this episode, Louis is cold and calloused toward Donna -- he rejects the notion that she ever cared about him and states that if she had to do it over again? She would probably throw away their friendship if it meant he would have never found out about Louis's secret. What I've always admired about Donna Paulsen -- one of the strongest female characters on television, honestly -- is her resilience and her determination. She's stubborn and she never backs down from a fight. She's unafraid to challenge even the people she cares about and it's what makes her such a wonderful character. And the reason that she fights for understanding in this episode between her and Louis is because she cannot let him believe that she is the type of person who would use others in order to get what she wants. Donna is inventive and she's smart but she's not cruel and she's not cold. She's brutally honest. So her final conversation with Louis where she tells him that she told no one about Mike's secret (by the way, a great way to humble Louis and remind him that he's not some sort of special case -- he's just like everyone else when it comes to information he is or isn't privy to), there's a hint of trust rebuilding between Louis and Donna. And then he asks if she ever slept with Harvey and it blindsides both us and her. But Donna Paulsen, queen of my heart and of that scene, holds her head high and tells him the truth. And then she walks out of the room. 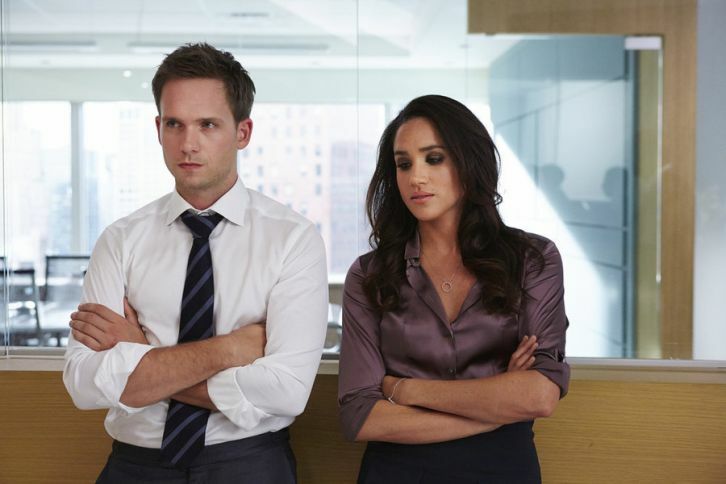 Suits is a show that is full of moral ambiguity -- do you lie to someone to protect yourself? Do you trust people who've proven they can hurt you? Do you ask for favors from your enemies? -- and it's always at its most interesting when it tackles the dichotomy between truth and lies and between power and weakness. I'm intrigued to see where this season will go in terms of those themes. Join me for the ride, won't you? MVP goes to Rick Hoffman. If I have to say why, you probably didn't watch this episode. Also, kudos to Gabriel Macht who directed this episode! I think my favorite scene was the opening one with Harvey in the car. It was pretty fantastic. KATRINA WAS BACK. I missed her. "What kind of math are you doing?" Thank goodness there was a mention of Mike's photographic memory this week and it was actually a plot point! Sometimes I think this show forgets what its premise was. "Did you pick something out of your generic favor file?" Harvey always gets the sassiest lines. "And it's exactly what Harvey would have done." SNAP. "You're just a pretty face." "Oh, you think I'm pretty?" "Pretty stupid." I missed Jessica/Harvey banter and I'm also glad they're back to a good place in this episode. "This firm's changed names more times than Prince." "... Who?" I loved the meta mention of how many times this firm HAS changed names. Geez. Amazing review! In my opinion, Louis managed to be loved and hated throughout the whole series, Rick's perfomance is just breathtaking.